Restoration work on the ponds in September 2012 involved removing invasive plants and cattails, grading and mulching the banks, planting new beds along the banks and installing over 26,000 plantings of native submergent and prairie plants. 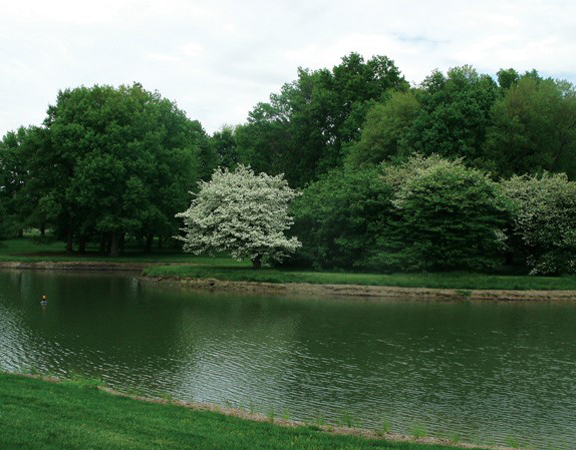 The Ponds were developed in 1997 as a gift-in-kind valued at nearly $600,000 from the Illinois Land Improvement Contractors Association, whose members volunteered 72 working days to dig the three ponds in the 160-acre UI Arboretum. Donors include Birkey’s Construction Equipment, Capitol Machinery, Champaign Asphalt Co., Kuntz Equipment Co., Roland Machinery, Co., and GROWMARK. Following recommendations by students in NRES 420 Restoration Ecology, arboretum staff cleared the pond banks and shallows of invasive shrubs, trees, and cattails during late summer 2007. Follow-up cattail treatment was made during summer of 2008. Once the majority of the cattails were controlled, the small east pond was graded and then seeded and plugged with native prairie and wetland species. 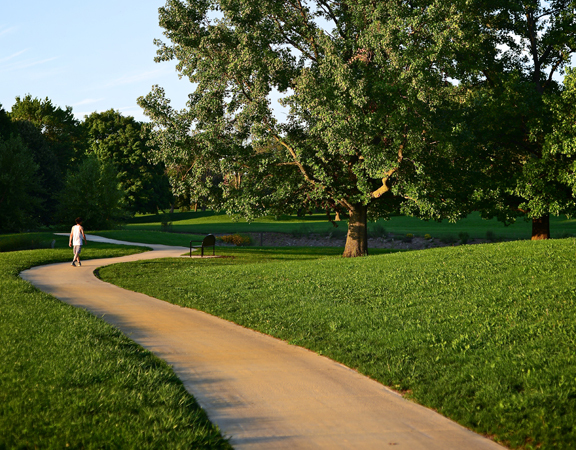 In 2010, a portion of the Dr. Frank W. Kari Fund was designated to support the University of Illinois Arboretum. The gift on behalf of Dr. Kari (1951–2007) was used to construct a sidewalk around the perimeter of the ponds. In addition to the walkway, which measures about 1/3 of a mile per loop, the gift was used to further enhance the ponds, install native plants and trees adjacent to the ponds, and install benches and educational signage along the walkway. A portion of the endowment was reserved to care for the plants, signs, and walkway. Work on the ponds involved removing invasive plants and cattails, grading and mulching the banks, planting new beds along the banks, and installing over 26,000 plantings. 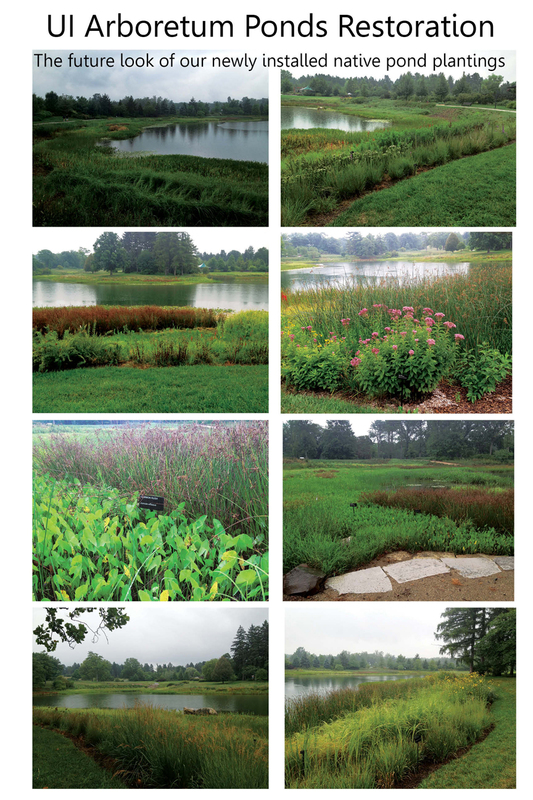 The plantings included a variety of native submergent and upland, or prairie, plants. The Dr. Frank W. Kari Walkway and Ponds Restoration Project provides a look at various types of native plant communities found in Illinois. The ponds are planted with individual species of forbs, grasses, sedge, and rushes common to wetland and prairie communities. The ponds are home to many kinds of wildlife, from Canadian geese found nesting along the banks in the springtime to turtles, frogs, koi and other fish, rabbits, squirrels, and many species of birds. While the wildlife may be enjoyable to watch, we ask you not to feed them. Please do not wade, swim, fish, or boat in the ponds (or iceskate on them in the winter), and keep children a safe distance from the banks. Please be courteous by picking up after pets and keeping them on a leash. Sedge meadow plants such as Mimulus ringens (monkey flower) and the many species of Carex (sedge) tolerate soil saturation or seasonal inundation. Shallow water–emergent plants such as Peltanda virginica (arrow arum), Scirpus (bulrush), and Juncus (rush) are often inundated for much of the year with one foot or less of water, but they can withstand water receding during the summer. Deep water–emergent or floating leaf plants such as Nelumbo lutea (American lotus) and Nymphaea odorata (water lily) are found in water 1 to 3 feet deep and rarely dry out. Mesic prairie plants such as Echinacea pallida (pale purple coneflower) and Aster laevis (smooth aster) occur on moisture-retentive soils in flat or gently rolling terrain. Dry prairie plants such as Sporobolus heterolepsis (Prairie dropseed) and Bouteloua curtipendula (side-oats grama) occur on well-drained upland sandy or gravelly sites. Wet mesic prairie plants such as Liatris spicata (dense blazing star) and Aster novae-angliae (New England aster) occur on rich moisture-retentive soils. Wet prairie plants such as Helenium autumnale (autumn sneezeweed) and Rudbeckia subtomentosa (sweet black-eyed Susan) are seasonally inundated in low spots or flat terrain.